Explanation: Are those UFOs near that mountain? No -- they are multilayered lenticular clouds. 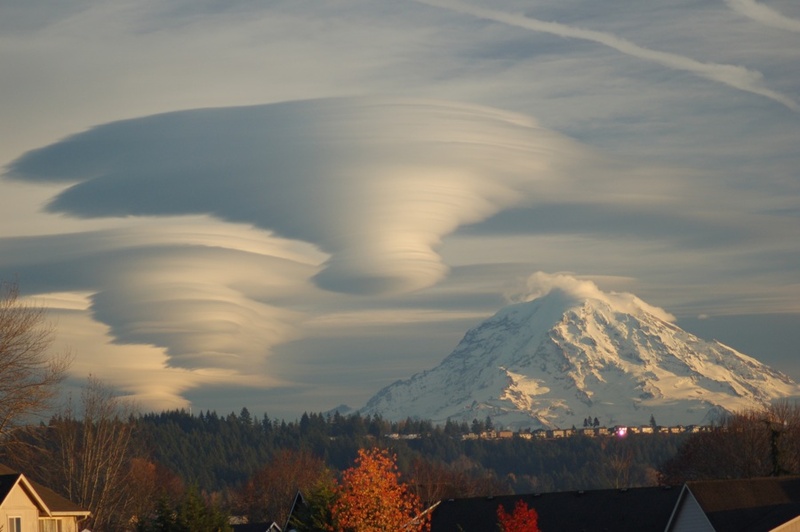 Moist air forced to flow upward around mountain tops can create lenticular clouds. Water droplets condense from moist air cooled below the dew point, and clouds are opaque groups of water droplets. Waves in the air that would normally be seen horizontally can then be seen vertically, by the different levels where clouds form. On some days the city of Seattle, Washington, USA, is treated to an unusual sky show when lenticular clouds form near Mt. Rainier, a large mountain that looms just under 100 kilometers southeast of the city. This image of a spectacular cluster of lenticular clouds was taken last December.